CLICK HERE To receive our Email Newsletter! Need a Gift Card ? Although we are now closed for the Winter Season, just give us a call at 716-373-2929 and we will be glad to arrange a Gift Card purchase for you. Please leave a message if no one is in the office, and we will return your call promptly. Think Spring ! We will open Friday April 19 for the Spring 2019 Season ! 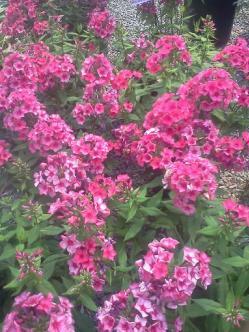 Let us help you take the guesswork out of creating flower beds and landscaping,and be successful the first time. All suited especially to our area! New York's Southern Tier,and Northwestern Pennsylvania have unique weather. We know what performs best in our unique climate(Zones 4 and 5 See Zoning Map Below). 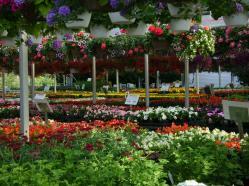 Let us help you choose the appropriate plants for your project. Pleasant Valley Greenhouse has been open under Dan Evans ownership for 33 years!!! Owner, Dan Evans grew up in Niagara County on a fruit and vegetable farm. Dan has an Associates Degree,from Alfred State College, in Ornamental Horticulture, with a major of Floriculture Production. Dan started in the Greenhouse industry in 1976...42 years ago! 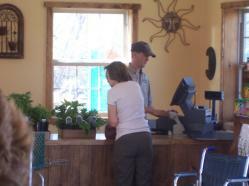 Dan Evans is always eager to hear your comments, suggestions ,and ideas to help Pleasant Valley Greenhouse to better serve you. Please e-mail your suggestions and comments directly to Dan Evans at daepvg@gmail.com - We would really appreciate hearing from you! The greenhouse business hours vary with each season.We are open on Sunday only in May,June and during the Christmas Season. 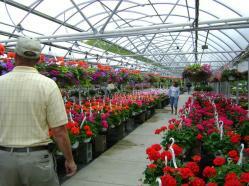 The key to Pleasant Valley Greenhouse’s success is their longtime experienced sales staff. The staff, all have been with Pleasant Valley Greenhouse for many years each,and they know the annual and perennial flowers,shrubs and trees that thrive in our area. We would be glad to help you with your project ! Please continue scrolling to the bottom of this page and check out where YOU are on the USDA Hardiness Zone Map!! BETTER PLANTS...BETTER RESULTS...BETTER VALUE !!! This year 2017 is our 32 nd year selling HARDY flowers, trees ,and shrubs in the twin tiers!!! Let our experience help YOU be successful the FIRST time !!! This is a USDA Hardiness Zone Map of New York State and of the state of Pennsylvania.It has been re-done for 2012,for the newest version you may go online and search for it,type in USDA Hardiness Map.For 2012 it now claims we moved up a half a zone ,and we are now in zone 5a (-15 to -20 degrees F ) . 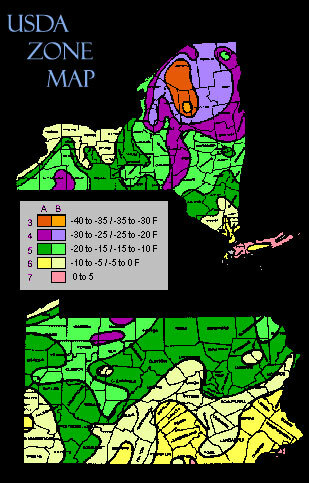 It shows the coldest average temperatures that can be expected in different areas of the 2 states in any given winter.This map is valuable to us because all the Trees,Shrubs,Evergreens and Perennial Flower Plants have a hardiness zone rating.The rating tells us the coldest zone the various plants will survive in. Here in the Olean NY and Bradford Pa areas we are in zone 4(as of 2012 now zone 5a) . There are however many places within our area that are more protected,especially in the citys and villages,where zone 5 plants will grow just fine.It is also interesting to note that our friends in Buffalo NY, and Rochester NY up along the lakes, are actually two zones warmer than we are here in this area of the twin tiers.We carry a wide variety of perennial flowers,trees,evergreens and shrubs that are especially well suited to our unique area.